Last week Marabou visited the Metropolitan Museum of Art in New York and was surprised to see some curatorial additions to the American Wing galleries. There are now supplemental labels with white type on navy blue background that are entitled “Native Perspectives” placed next to a handful of museum labels for objects that depict Native American people. 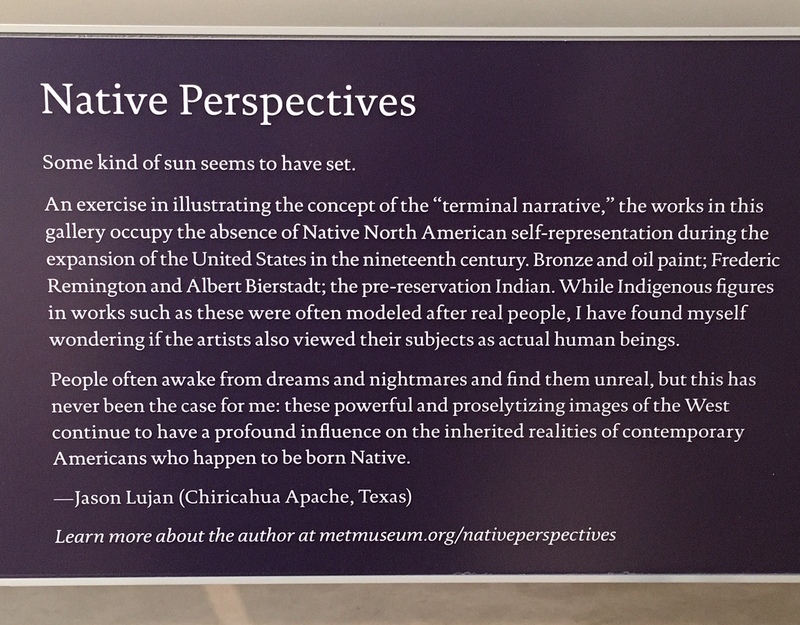 These navy blue labels are written by indigenous artists and historians, and provide points of view that has been missing from the Met’s American Wing since its inception. This initiative is in conjunction with the opening of the exhibition, “Art of Native America: The Charles and Valerie Diker Collection” (Marabou will discuss this exhibition in a later post). “Art of Native America” is slated to run until October 6, 2019. Marabou hopes that this process of inviting less represented, non-white, non-western perspectives into the American Wing is not just a fleeting gesture, but one that continues and moves beyond the American Wing to permeate the entire museum. The “Native Perspectives” labels were added alongside a number of objects mentioned in Marabou’s August 2018 analysis of the American Wing. Marabou is sharing some of those objects and their supplemental labels below. Reading the original label and the “Native Perspectives” Label side by side further exposes how objects and history are framed in very particular ways and illustrates that adding another voice to the conversation can dramatically change and add nuance to an object’s narrative. In the post “American Woman,” Marabou wrote about the portrayal of women in the American Wing. “Mexican Girl Dying” is one of the works addressed. It now has a “Native Perspectives” label written by artist Livia Corona Benjamin (Mestizo). Livia Corona Benjamin’s label connects historical representations to contemporary events including tensions between the US and Mexico border and the often ignored or unknown reality that 1 in 3 indigenous women in the United States and Canada go missing or are murdered. According to the Indian Law Center, more than 4 in 5 American Indian and Alaska Native women have experienced violence, and more than 1 in 2 have experienced sexual violence. The connection of past and present is echoed in other “Native Perspectives” labels that emphasize the continuing, present impact of historical violence and marginalization. In the post “Native Americans and Manifest Destiny at The Met” Marabou discussed the portrayal of Native Americans in Gallery 765, “The West, 1800-1920,” filled with paintings and bronze sculptures of Native Americans. The “Native Perspectives” label is not in response to one object, but to the entire gallery. Artist Jason Lujan (Chiricahua Apache, Texas) writes of the inescapable impact of the US government’s dehumanization and removal of Native Americans from their land and cultures, all while creating a false narrative that is perpetuated in US history textbooks and museum galleries to this day. “Some kind of sun seems to have set. The heavily edited narrative of the US government’s relationship with native people is also addressed in a “Native Perspectives” label for the American Wing’s pride and joy painting, “Washington Crossing the Delaware” by Emanuel Leutze (also addressed in the post “Native Americans and Manifest Destiny at The Met”). The label is written by artist, writer, lecturer, and curator Alan Michelson (Mohawk). He draws attention to a person in the painting who normally doesn’t receive much attention. Michelson’s label adds great historical context to an iconic painting that graces the pages (possibly even covers) of many US history textbooks. Where the Met emphasizes the painter’s story (as one would expect an art museum to do), the supplementary label makes sure to remind viewers that a celebrated event in US history also had Native American participants who did not reap the benefits of revolutionary freedom from England. The final “Native Perspectives” label Marabou shares with you is not related to a work discussed in a previous post, but is one that emphasizes that Native American culture is not gone or of the past, but very much a part of the present. The painting “Dance in a Subterranean Roundhouse at Clear Lake, California” by Jules Tavernier hangs in the same gallery as “Washington Crossing the Delaware.” The “Native Perspectives” label is by interdisciplinary artist, writer, and educator, Ty Defoe (Ojibwe and Oneida) in which he recounts his experience growing up in the roundhouse, writing in the present tense. “Parisian-trained artist Jules Tavernier settled in San Francisco, in the 1870s, where he received his most important commission from Tiburcio Parrott, the city’s leading banker. During a visit from his Parisian business partner Baron Edmond de Rothschild, in 1876, Parrott was able to obtain entry to a sacred ritual in the Pomo Indian’s underground roundhouse at Clear Lake, north of San Francisco. The two men were in the process of acquiring the mineral rich lands of the Pomo Indians, which the tribe had inhabited for generations. we go to the roundhouse. It was played in the roundhouse. The dust rose from the dancers’ feet. as if everyone was transforming into animal clans inside a lodge. Marabou has shared just four of the new “Native Perspectives” labels now in the American Wing at The Met. There are eight more to read on the Met’s Native Perspectives page. Marabou appreciates the action taken to include indigenous perspectives in the American Wing, however, Marabou is not patting The Met on the back. The Met’s work has just begun. 12 objects in the American Wing have been annotated, a small step in the right direction. Marabou finds value in reading the Met’s original labels and new “Native Perspectives” labels side by side. Together they provide a better understanding that objects and history can be spoken about in a multitude of ways, and that there is value as well as danger in this flexibility. Museums and cultural institutions need to continually revisit the narratives they share. Especially if they have been telling the same story that has been told for decades (even centuries), it’s time to re-evaluate the way objects and spaces tell stories and make space for new narrators of those stories.